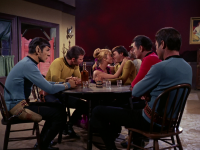 - When Chekov is with Sylvia and she proposes marriage, there are several shots that cut between a left angle and a right angle of the two sitting on the bench. Whenever it's from the left angle, her arm is around his. Whenever it's from the right angle, her arm isn't around his. It goes back and forth like this a few times. - DeForest Kelley, who plays Dr. McCoy, has a history of portraying the Wild West characters from this historical event, as he has also played Ike Clanton in a 1955 episode of You Are There as well as Morgan Earp in the 1957 film Gunfight at the OK Corral. 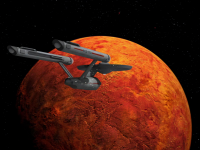 - The probe warning the Enterprise to leave in the native languages of every crewmember. - Chekov diving into his role. - Kirk trying to tell the bartender who he really is. - Kirk trying to tell his enemies who he really is. - Kirk and his crew trying to leave the city. - McCoy meeting Doc Holliday. - Spock mentally preparing Kirk, McCoy, and Scotty for the battle. - The crew standing there while the bullets do nothing. - Kirk regarding Chekov: "Perhaps that explains why he's here. Nothing was real to him except the girl!" The Enterprise encounters a xenophobic race, brazenly ignores their warnings to go away, and faces the consequences they rightly deserved. Kirk's decision to arrogantly ignore the aliens' wish to be left alone was bad enough, but setting foot on their frigging planet on top of that was downright unforgivable. 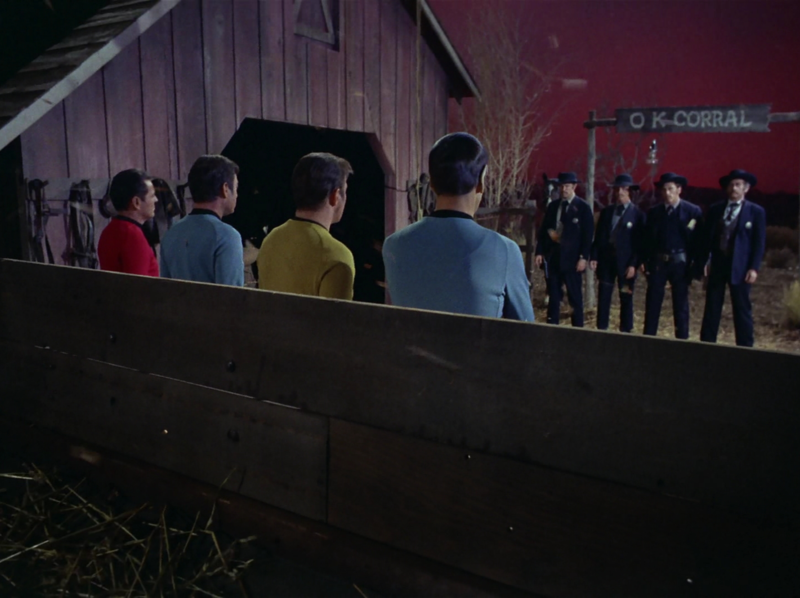 Though without Kirk's brazen act of trespassing, this wouldn't have been much of an episode, now would it? That said, this episode is the first to explore the power of illusions in a sufficiently novel way since The Cage and does so just as masterfully, if not better. Unlike The Cage, the landing party is well aware that they're inside an illusion right from the beginning, so the focus is instead on figuring out how deep the illusion goes. The delightfully incomplete nature of the sets reflect this conundrum in a strikingly visual way, as the illusionary town of Tombstone is comprised of fragments of buildings missing most walls, exposed to an eerily alien red sky. I suppose it's pretty obvious that this stylization was a budget saving move, but I'd say it's a well earned one, as it added a surrealist quality to the drama which enhanced the discomfort and out of place feeling that the characters struggled with. The most striking detail of the story is Spock training the landing party to disbelieve the illusion, thus robbing it of its power. 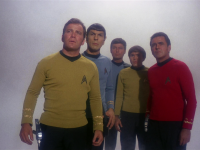 This nice piece of writing manages to be both the episode's most dramatic story point when it climaxes in the gunfight scene as well as the episode's funniest story point when we discover at the end that Chekov hadn't in fact died because he never took the whole situation seriously to begin with. The constant sense of dread the rest of the landing party experiences as the episode builds to its climax was overall well played; I enjoyed seeing them try so many different things to avert their fate with each attempt failing in rapid succession as the clock ticked closer and closer to five o'clock. 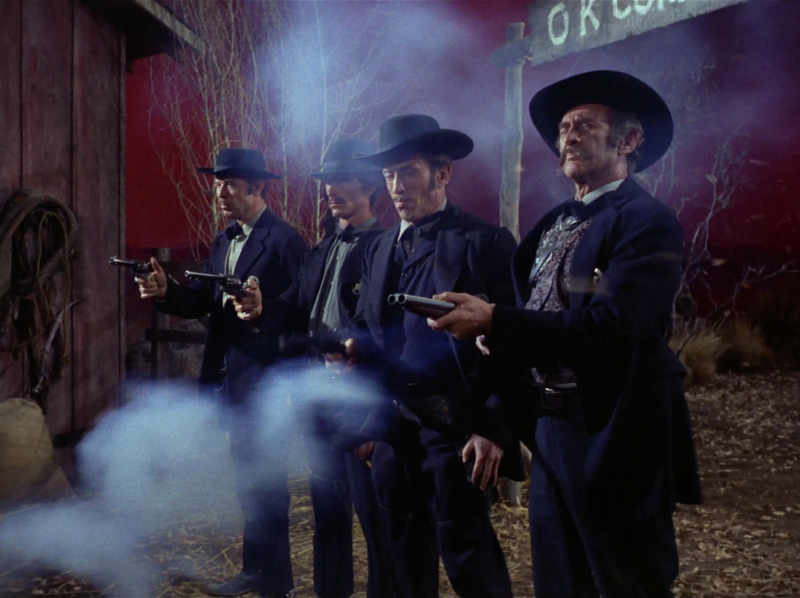 Unfortunately for the plot, however, the gunfight at the real OK Corral didn't actually occur at five o'clock. It took place near the hour of three o'clock instead. There were other historical inaccuracies as well. For instance, the gunfight is depicted as taking place just outside the OK Corral, but in reality it took place some good distance away near Fly's Photographic Studio. Also a sign visible in this episode at one point noted Wyatt Earp as the marshal of Tombstone. However it was actually his older brother Virgil instead in reality. Wyatt was only a deputy marshal. 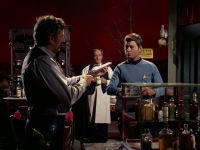 Finally Kirk during one part of the episode made a big point about how Billy Claiborne (the character Chekov played) was the only one of their crew to survive the gunfight, but apparently Kirk had forgotten that his own character, Ike Clanton, also survived. I suppose all of those historical inaccuracies could be chalked up quite easily to the aliens having created the scenario from Kirk's inaccurate recollection of history, but unfortunately nobody else seemed aware of all of these errors either, even despite Spock's apparent expert knowledge of the period. Not all of the errors in the plot logic are confined to historical inaccuracies though. Another notably odd detail was the whole subplot when the landing party refused to trust their illusionary guns so they resorted to trusting the other illusionary resources at their disposal instead, which is a striking error in reasoning because if you can't trust the illusionary guns, why would you think you could trust anything else in that illusionary world? 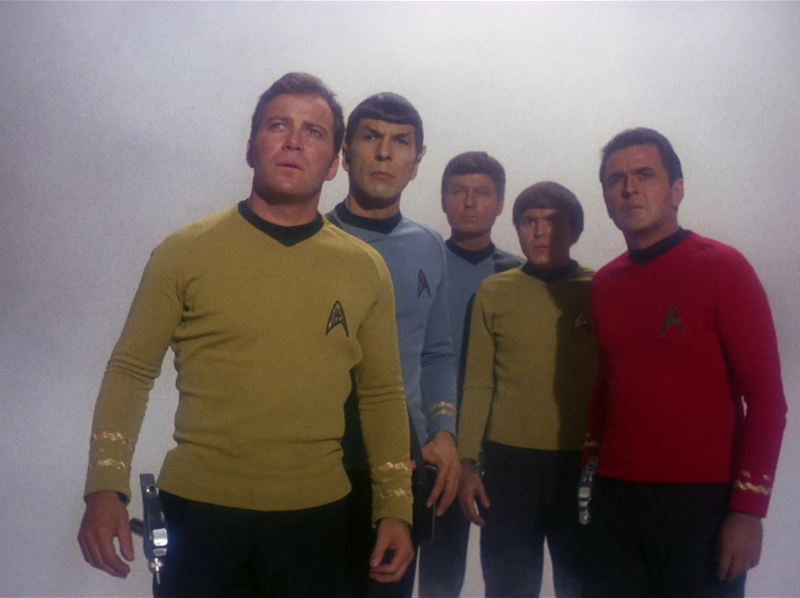 I was also a bit put off by the scenes when the landing party all mourned Chekov's death. There's a ticking time bomb about to go off in their faces and they're all more interested in talking about their feelings for an extended period of time? How silly. Spock had every reason to be annoyed with them all. 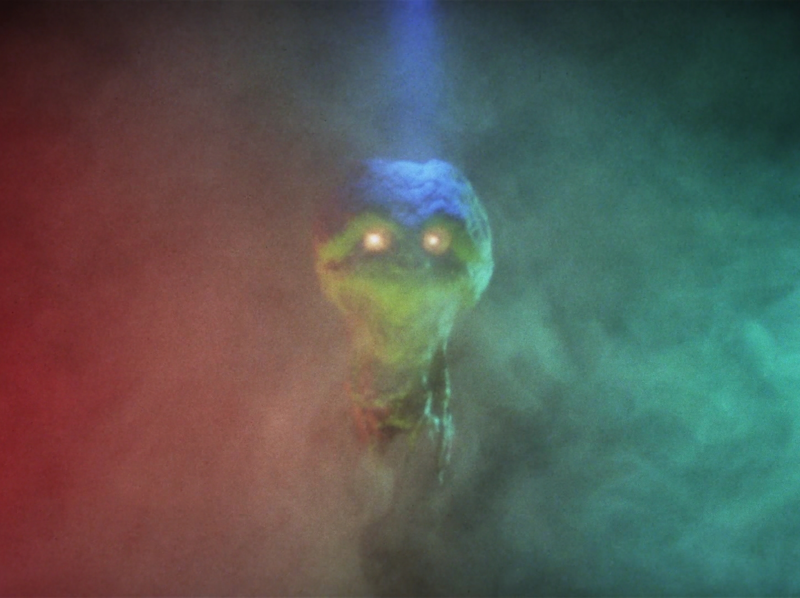 A final odd detail of the plot was that curious scene when the alien message is noted as having been broadcasted in the native languages of everyone on the ship. It's implied that the alien telepathy enabled that. However, what I find curious is the fact that the crew could tell the difference between an alien speaking in an alien language with the universal translator translating it as opposed an alien speaking the native language of various crew members. This implies that however the UT works, it isn't entirely seamless. Whenever it's translating an alien language on the fly for you, you can tell when it's working its magic and when it's not. As for the ending, I felt that it was weaker than The Cage's. In The Cage, the aliens learn something. 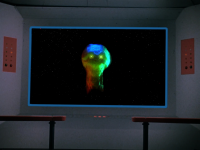 In this episode, the aliens are just engaging in some bizarre test of the Enterprise's resolve and the plot grants little insight into their motives. By the end of the story a magic switch is flipped and they suddenly go from being xenophobic to welcoming a Federation delegation simply because the landing party saw through the illusionary danger they created. 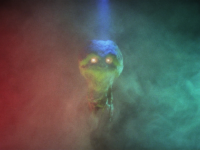 But even though the aliens of this episode were less well conceived than those of The Cage, this episode managed to be a bit more entertaining simply due to all the fun aesthetics and psychological tricks noted above. As such, I would declare this episode the superior story of the two, by a hair. I'm always tempted to skip this one because I can't stand westerns, but this episode goes beyond the standard "put crew in earthlike situation." It stays focused on one thing, the upcoming moment of dread for Kirk and the landing crew. They try so many things to avert their fate, but all of them fail, say one. Kind've gripping for a third season TOS episode. I thought the aliens were suddenly friendly at the end because Kirk refrained from killing his adversaries at OK Carrol. This showed them that human beings are decent. I liked the alien's design btw. It was eerie and effective. However, when Scotty tests the tranquilizer on himself, he believed it would work - but it did not. Is this not a contradiction? Spock says, "History cannot be changed." Say what? As ridiculous as it sounds, history _was_ changed in all their time travel episodes (albeit "restored" in the end). And there weren't buildings with missing walls and our heroes "playing" the Clantons in Star Trek uniforms in Tombstone AZ, and so on. Strikes me as somehow different. 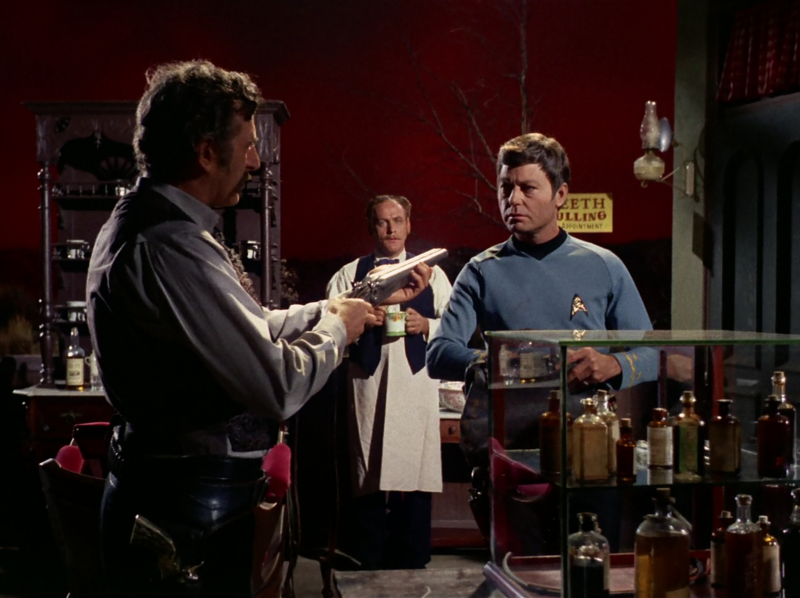 I think it's awesome when Kirk fails miserably to convince various townsfolk that they are not the Clantons. Chekov "died" because he believed the bullet was real? Please, that's just plain ridiculous. 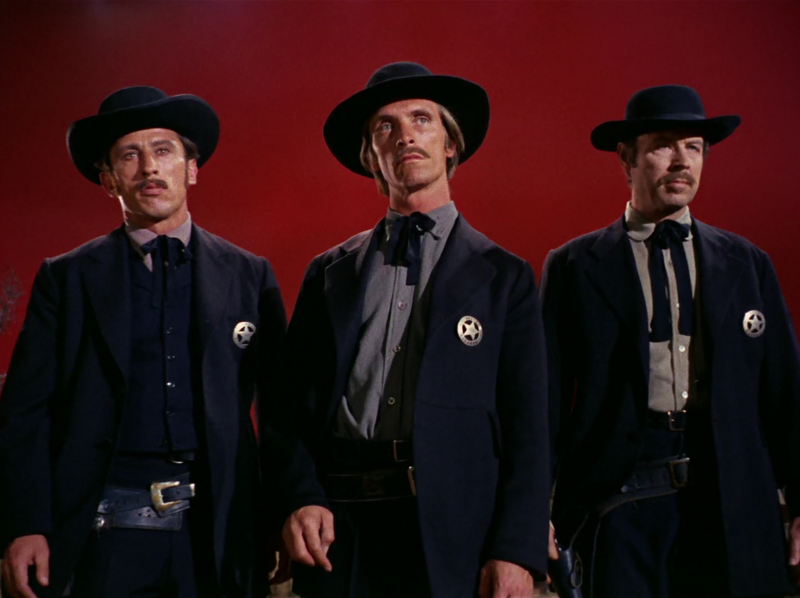 Kirk says he can't just kill or murder the Earps and Doc Holliday, but in other episodes he killed "humanoids" in self-defense, which is what this would have been. At the end of the episode when the Earps and Doc Holliday are walking toward our heroes in the corral, they keep appearing in a different order; it changes with every shot! 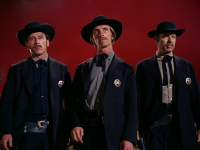 Notice that the bullet holes behind our heroes aren't really in line with them and the Earps. Well, that's how it looks to me. Eh. I gave it a 5/10. This episode, though not having any massive problems, is rife with little ones. Like Kethinov points out, the crew's belligerence about forcing themselves on the aliens is out of character and rather contrary to the spirit of Star Trek. "No" means "no", boys. 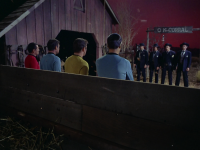 The idea of using a Western setting seems little hokey and odd (further justifying my semi-serious theory that many Star Trek episodes' plots were dictated by whatever set pieces were laying around the film studios that day. "Hey! There's a bunch of cowboy stuff left over from yesterday's episode of 'Bonanza'! Let's use that!!"). The exploration of reality is interesting enough, but they seemed to drag out the resolution to a length that defies some logic. 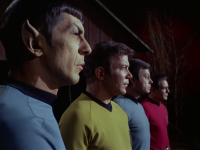 The crew, Spock included, very quickly recognized the aliens as "pure telepaths." As such, it seems that at least Spock would have figured out that the things they were seeing and experiencing were illusory. It probably shouldn't have taken Chekhov's "death" and the failure of the gas grenades for him to figure it out. The recognition of McCoy that humans will always have doubts about reality was a very intelligent touch, and having Spock use the mind meld to assist them was intriguing. Decent episode, but not one of the better ones I've seen. I really like this episode though of course, it has its problems! Your first paragraph pretty much describes EVERY episode of just about EVERY TV show ever put on the air! Everything is contrived to make something interesting, and it's not any different than Hitchcock's 'Dial 'M' for Murder' where the protagonist states that every crime book is written so contrived that the hero has to solve things the way they unfold! 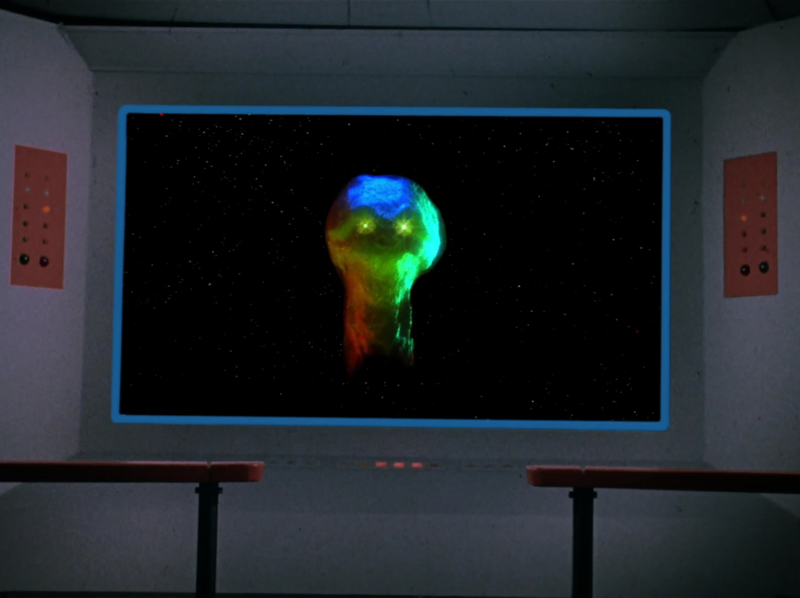 My nits with this episode are mostly regarding the Melkot's interpretation of what they see in Kirk's thought record from which they derived the scenario. The town, to me, looked exactly like how one might dream a place, and so I was amazed at how good that was done! On the other hand, why is 'history' so carved in stone? Especially in Spock's mind?!? They are getting their 'history' from Kirk and no one else! He could've imagined fairies dancing around for all they knew! Again, the show is contrived to play out how it did, and I really liked it!!! Nice guns, man!! !